Q: I’d like some guidance about determining the Critical Micelle Concentration of Liquinox and Citranox detergents, and some of the limiting factors in that determination. A: Thank you for your question about the Critical Micelle Concentration (CMC) of surfactants in Liquinox® Critical Cleaning Liquid Detergent and Citranox® Liquid Acid Cleaner and Detergent. A micelle is an aggregate of surfactant molecules in a liquid solution. 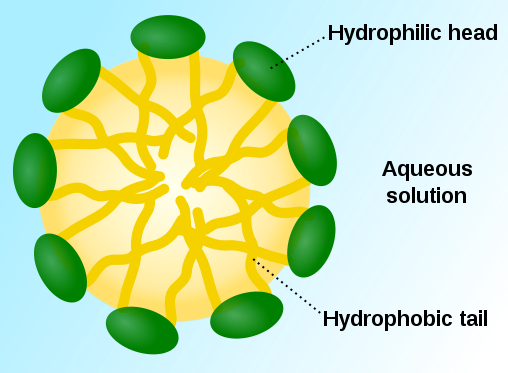 Micelles form only when the concentration of surfactant is greater than the (CMC), and the temperature of the system is sufficient for micelle formation. The utility of a micelle formation is that it can emulsify a contaminant that would otherwise be insoluble. This allows for it to be removed and the surface from which it came, can in turn be cleaned. The CMC varies with electrolyte and residue content of solutions. It generally decreases as micelles shift from globes to rods in a more hexagonal arrangement in response to electrolyte content. The CMC of the individual surfactants is sometimes known at 25C in DI water. Both Liquinox and Citranox detergents contain similar mixtures of anionic and nonionic surfactants that form mixed micelles. The mixed micelle CMC can be experimentally derived for any specific set of conditions. In general, a mixed micelle CMC will be lower than the average of the CMC of the constituent surfactants. Again, this mixed CMC value will be dependent on temperature and residual contamination. ​For the Liquinox and Citranox detergents you are inquiring about, the mixed micelle CMC in DI water is somewhere between the detergent specific isomers and the alcohol ethoxylates. The isomers for Liquinox and Citranox are Sodium (C10-16) Alkylbenzene Sulfonate and (C10-16) Alkylbenzene Sulfonate salt respectively. If you want to evaluate how the range of CMC based on residues and electrolyte concentration might apply to your application, we are happy to discuss.